This is a really fun pattern to make that only looks difficult. 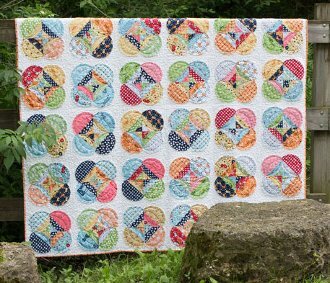 Normally, a quilt like this would be pieced by using templates for each part of the block and assembling them using curved piecing. You can simplify this by using a special ruler (or included template) and raw edge applique! Sizes Baby 36" 36", Youth 48" x 60", Lap 60" x 60" Giant Lap 72" x 72", Twin 60" x 84", Queen 84" x 84" and 108" x 84"